Blonde hair =/= Nordic. That would be like claiming Italians were ancient Egyptians because Egyptians undoubtably mostly had dark hair and brown eyes. Hair color does not, ever substitute for genetic data. Even in the Middle East there are people with blonde hair, they are not Northern European. 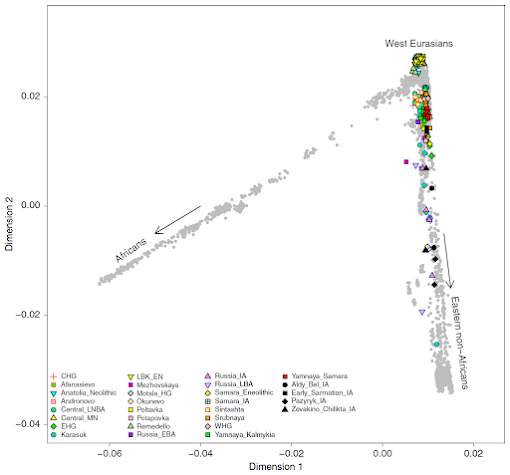 It is not surprising that they are closer to the people with the highest East Asian admixture/Yamnaya in Europe. Swedes, Finns and Russians. Scythians were a linguistic group the assumption that they were "originally all blondes before mixing", is flawed because it assumes they were ever a single existing homogeneous nation, they were not. And Greeks used the term interchangeably with all people from the steppe. Furthermore all the groups who associated them with blondism WERE darker groups. It is a fact that lighter hair has different definition in darker populations. Due to the fact they are mostly dark haired even brown hair was considered light by Greeks. Modern day Northern Europeans aren't even all blondes, it is a minority even amongst them. So to suggest everyone within a group was blonde is nothing short of pure fantasy. Ancient groups also had habits of dying their hair lighter colors. So just because some artworks portray these people as that way doesn't mean it was reality.